Float therapy is a mind-body option used by health-conscious individuals who understand that wellness begins from within. Floating is most effective in conjunction with a healthy lifestyle and used regularly to maintain positive effects. Those who regularly float experience lower anxiety and stress levels, increased focus, improved sleep, faster recovery times and elevated moods. Business/health professionals and athletes who want to improve their focus by reducing stress and speed recovery times, and those who with physically or emotionally demanding jobs who want to reduce the effects created by these environments can benefit greatly with float therapy. 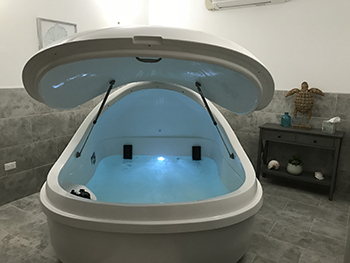 The first float may not be a good indicator of future float sessions as you are using your first time to acclimate to the new sensation and routine of floating. We recommend floating at least three times in a short period to find your comfort zone and develop a habit that will change your life. We offer discounted packages to encourage frequent floating. The density of 900 lbs of Epsom dissolved in 120 gallons of water makes you feel almost completely weightless, letting every single muscle in your body fully relax. Float therapy is an intentional reduction of sensory stimulation and allows your brain to rest, reset and refresh. In this state, the brain releases vast amounts of endorphins, a “feel good” chemical. 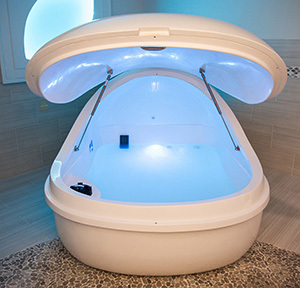 Floatation research reveals remarkable benefits from repeatedly using float tanks. The effects of floating are cumulative. A lack of sensory perception creates an environment for you to meditate, focus, connect and evaluate your most inner thoughts and feelings without external distractions. Clearing our minds of our thoughts is an opportunity for us to evaluate our thoughts, memories and emotions in a positive environment. The wonderful thing about float therapy is it reduces stress which is responsible for so many health problems. Many doctor visits are for stress related illnesses. Use float therapy routinely to reduce doctor visits and improve your health.